Anne Weisgarber 2009 novel (also her debut novel) follows the story of Rachel DuPree, the wife of Isaac DuPree a proud landowner in the South Dakota Badlands in the 1917. The lands have been recently caught in a bad drought, and Rachel is pregnant and struggling to feed her family. The events of the drought lead to her beginning to re-assess her life and leads to an almost Doll's House like conclusion.I wasn't particularly enamoured with this book. What I did like was the writing style; it's told entirely from the perspective of Rachel, which is carried through right down to the grammar, which is quite rare. Plus, Weisgarber's descriptions of the Badlands brought them wonderfully to life, and also the made you feel like you were there inside the DuPree family home and ranch. 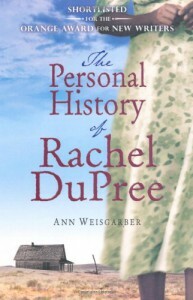 I also really liked the way that Weisgarber managed to weave in the 'personal history' of Rachel; rather than kind of shoe-horning her past into the narrative. Character-wise, I felt that the children; Mary, John, Alise & Emma were all wonderfully fleshed out, their actions seemed very realistic for young children.However, I did have problems with it. Firstly, I felt that the character of Isaac DuPree wasn't really fleshed-out properly, although this is naturally a problem with first-person narrative. I wanted to know more about him, and he was painted as an unsympathetic, land-driven character; and to my mind there must have been something driving this desire that wasn't heard. Plus, I occassionally struggled to have sympathy for Rachel herself. She married Isaac knowning that he didn't necessarily love her, and offering herself basically as a helper for his time on the ranch. Yet now she feels hurt that he doesn't love her, and from the moment I read the chapter about the early part of their relationship I struggled to gather what exactly Rachel would expect from essentially selling herself to a man (he would get more land if he married her), an idea she put forward herself.I occasionally wondered why Weisgarber made the DuPrees African-American as well; there seemed many times when their race didn't really matter. Although it did enable there to be brief discussions about race riots, and about the double standards in the way that they in turn were prejudiced against Native Americans.The Personal History of Rachel DuPree is by no means an bad book, the prose is lovely but I guess I just didn't click with the main character, which is a problem when it's first person narrative. I will be interested to see what Weisgarber's future novels will be like.